Ellie Benson, a contact centre operator, was monitoring our social media channels early on Christmas morning when she got a message from a suicidal woman. It transpired the woman was contacting us from the west coast of Canada but Ellie remained in contact with her to keep her talking. In an amazing coincidence, we had PC Antoinette Rowe from Toronto Police, serving under the umbrella of the Royal Canadian Mounted Police, on attachment with us as she was staying with Surrey Police operator and schoolfriend Vanessa Reynolds. As Vanessa was working on that morning, Antoinette came too to observe. PC Rowe called her Vancouver counterparts and police were able to find the woman alive before taking her to hospital. Ellie reflected: “We get a number of messages from people who have mixed up Surrey, England with Surrey, Canada. “I was trying to get information out of her in order to provide the help she needed. We spent half an hour trying to work things out. “It helped that Vanessa Reynolds’ friend (PC Rowe) was in the contact centre at the time and was able to use her contacts to get information and we were able to work it out in the end and we were delighted to hear from an officer in Canada that they had been found and were being given the help they needed. Vanessa was certainly not expecting Antoinette to be working and had been hoping for a relaxed Christmas morning. She reflected: “It certainly wasn’t the plan for Christmas morning! I invited Antoinette to stay over Christmas, before I realised I was working. “Being a Canadian police officer, she was given the green light to join me in the contact centre. And then we put her to work. Antoinette’s presence made the work of Surrey officers’ slightly easier and she believes the incident highlights the multi-tasking in the force. She reflected: “Vanessa Reynolds and I have known each other for over 30 years, and once she heard I was heading to the UK, where I lived until 17, she asked if I would be interested in joining her at work for the day.It wasn’t a hard sell! “So, on Christmas Day I joined Vanessa, and the Surrey Police Dispatch team at work for the shift.Upon my arrival, I was introduced to the Supervisor, Jake Boatman, and several other dispatchers.I was also invited to partake in a Christmas breakfast. “While in the kitchen area, I was approached by Jake and asked if I could assist on an incoming radio call that involved a Canadian Police Service.I walked back into the main dispatch centre with him, and liaised with Ellie Benson, the dispatcher who was taking the call. “I was advised that a 23 year old female had contacted the Surrey Police Facebook page, believing that she was communicating with the Royal Canadian Mounted Police (RCMP) Facebook page, located in Surrey, British Columbia.She was clearly distraught, and having suicidal thoughts. “I reached out to my colleagues in Toronto. I spoke with an officer at my division, and outlined the situation that was unfolding. “This officer provided me with a phone number for Vancouver Police Department, and I immediately contacted them.Jake stood by me, providing me with updates of the call while on the phone to Canada. “I spoke with one of their dispatchers, identified myself accordingly, and provided details of the radio call.She immediately contacted the dispatch centre for that area, and remained on the line until it was confirmed that we had a ‘live’ person on the other end of the phone. “By the time we had managed to get through to the Surrey Dispatch Centre, additional information was provided to us via Ellie, who had been instrumental in eliciting critical information about this particular caller. “The RCMP call taker was able to immediately identify the female through their computer system, and dispatched two officers to her home address.Once this had been confirmed, the phone call ended from our end. “Quite honestly, my part was very small in comparison to what Ellie did.She recognised this could not end well, and kept an open dialogue with the young lady, while at the same time ensuring we were continually updated with additional pertinent information. The incident has helped bring the two forces together and Antoinette will be liaising with her counterparts in Surrey, Canada to enable closer working. 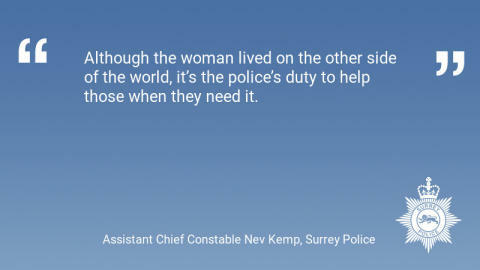 Assistant Chief Constable Nev Kemp said: “Although the woman lived on the other side of the world, it’s the police’s duty to help those when they need it. “It’s a lucky coincidence that PC Rowe was on attachment at the time and was able to provide assistance by speaking to their colleagues in Canada that we were able to reach the woman quickly. Whatever you're going through, call the Samaritans free any time, from any phone on 116 123.